The independent seat is widely recognized as an indispensable tool for the dressage rider, but what does the term actually mean? And how does a rider set about achieving it? It is one of many dressage terms that is surrounded in an unnecessary mystique due to a lack of understanding of the gymnastics required to achieve it. All of these uses of the rein contact inhibit the development of an independent seat, and thus prevent the correct engagement of the horse (known generally as 'putting the horse on the bit'). This is because in order for the seat to perform it's correct function of initiating the longitudinal stretching of the horse (involving the lifting of the back, stretching the neck forwards and round, and tucking the pelvis or 'sitting') it must be able to connect to the uninhibited flow of the horse's movement. To understand this, imagine the flow of water in a river. if it is stopped at some point by a dam, then there will be no current in order for a boat to be able to sail down it. On a horse, the holding hand blocks the flow of movement and the longitudinal stretching of the horse which is a crucial element of engagement. This is why the independent seat is so important, because if you decide to give up this control which the rein contact, then you have to replace it with something, and a major part of that is the correct seat, capable not only of sticking you securely onto the horse, but also of bringing his movement into balance by its levering action. Any mechanical or biomechanical system, such as a clock mechanism or a horse and rider, has fulcrums. These are points of stability around which other parts can move. This stability prevents separate parts of the system from falling apart during movement, and also permits the leverage that generates movement and power. For example, imagine two cogs in a mechanism: in order for these cogs to be able to push each other round, there must be two points of stability, one in the centre of each cog, around which they rotate. Otherwise they would simply push each other apart. These fulcrums allow the two separate cogs to join together in balanced motion. 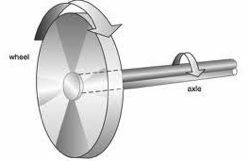 The same principle is true of the wheel: the stability of the axle joined at the centre of a wheel provides a fulcrum for the movement to be transmitted to a vehicle. Fulcrums must also exist between horse and rider, but it is only an independent seat that allows them to exist in the right place for engagement to take place. 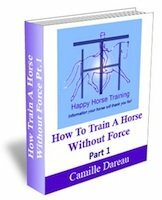 Unfortunately the main fulcrum between horse and rider very often resides in the rein contact, and this becomes the main point of holding around which all the other forces of movement occur. This fulcrum may be effective at keeping horse and rider together in a crude way, but because it fixes the front end of the horse (through the bit) it blocks the circular flow of movement of the horse engaged on the ring (see What does 'on the bit' really mean?). For engagement to be possible, the main fulcrum, or point of stability, must be in either the seat or the leg, so that there is a central point of unification between horse and rider around which the movement can flow unhindered, just like a wheel rolling round its axis. The independent seat is just a way of describing this fulcrum existing in the seat rather than in the hand. The difference in the feeling of these two different fulcrums - that of the holding hand and that of the independent seat - is totally unmistakable: one feels like you cannot let go of the reins without losing balance and control, the other feels like you are joined to the horse through your seat no matter what, connected to the motion, and you feel able to give out the rein at any time without losing your balance and control of the horse. Of course the fulcrum may oscillate between hand and seat during a session, depending on the rider's ability to maintain the correct dynamic, but it cannot be in both places at the same time. You can also train your eye to start being able to see where the fulcrum is when watching a horse and rider. Interestingly, it is in the nature of the fulcrum, the point of stability, that it doesn't jump out at you when you are looking at a movement dynamic, precisely because it is a place of stillness rather than activity (perhaps this is why such a lot of holding in the reins goes unnoticed in dressage competition). A rider with the fulcrum in the rein contact will inevitably have a lack of connection between the seat and the horse's movement. Sometimes this can be seen clearly as the seat bouncing out of the saddle every stride, or sliding back and forth on top of it, sometimes it is less obvious. If the fulcrum is in the rein contact, there will be less movement here that in the connection between the rider's seat and the horse, but if you look closely you will be able to see the tension in this holding, because it is working against the movement of the horse. Note: we are not implying here that the rein contact is in itself incorrect, only the holding rein. It is the horse that creates the correct contact by stretching forwards into it, making a connection that goes straight to the rider's seat via a soft wrist. If the fulcrum is in the rider's seat and leg contact, because they have achieved an independent seat, then you can see this as a seamless connection joining horse and rider, so that their two bodies seem to become one entity. 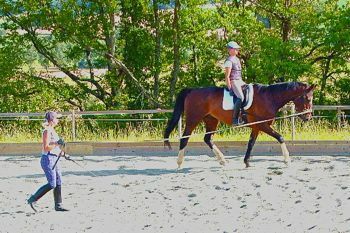 In this case the rein contact will be able to slacken (as in this photo) without any change to the overall stability between horse and rider. 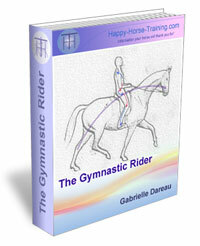 The strengthening of the rider's core muscles in order to support the pelvis in this correct position, enabling the channelling and re-balancing of the horse's movement. These properties cannot be acquired without the rider's commitment to letting go of the rein fulcrum just as you can never learn to swim if you don't let go of the edge. Many riders struggle with this letting-go because they have not understood simply how to position their pelvis relative to the horse so that it can actually engage with the horse's movement and replace the holding rein. Instead their pelvis is positioned against the flow of movement, fundamentally disconnecting them from it. For this reason, receiving training on the lunge without reins, is an excellent and perhaps indispensable way of developing the independent seat. It allows the rider time to focus on the correct position, while at the same time undoing the rider's often heavy reliance on the reins. 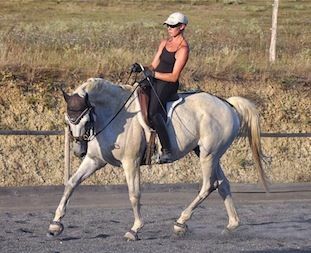 We have taught a wide variety of riders in this way, some were hardly able to rise to the trot without the support of the rein contact to begin with, despite being well-established riders. Acquiring an independent seat takes a great deal of dedication, because in order to develop the strength, suppleness, and muscle-memory required, you must not only put yourself in a position which does not feel comfortable or strong, but you must also learn to let-go to the horse's movement in order to start forming the connection between your seat and the horse that eventually becomes a powerful tool in your riding. 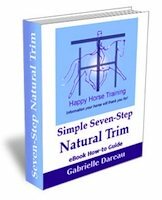 Due to the difficulty of this process, and the time and patience it requires, the truly independent seat is a rare thing in dressage, when it should be a basic necessity. 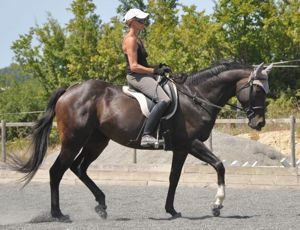 Perhaps if dressage tests included a compulsory figure to be performed on the loose rein not only in walk, but also in trot and canter, to show the control and connection of the independent seat, this might begin to change.